One of the primary goals of the Jewish Life Centre is to create Sandton's most dynamic Jewish Learning Centre. That's why we almost 30 Torah classes a week, as well as a host of one-on-one learning opportunities. All that learning needs a substantial library, and this week we installed the first phase of the Jewish Life Centre library. Michael Levy, an expert craftsman, hand-fashioned two magnificent bookshelves and completed installation at the begining of the week. These bookshelves, the first two of a dozen, carry almot 1000 volumes. Now that we have somewhere to put them, we've hauled out hundreds of books we've collected and held in storage over the last couple of years. Included in the new library are two compelete sets of the Artscroll Talmud, discourses from the various Chabad Rebbes, Parsha commentators, the Shulchan Aruch and a wide range of English publications. All we need now is for you to come and use these valuable resources. 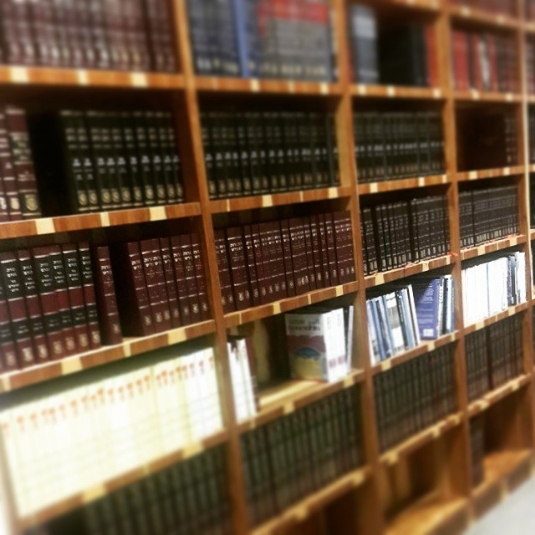 Check our Shiur schedule or pop in to study with a partner or simply browse a Jewish book. If you would like to sponsor books or bookshelves for our library, please contact Rabbi Shishler.